How hippie hitchhikers saw Alabama in 1973 | Michael Fuhlhage, Ph.D.
One hazard of packing for a move is that books can distract you from getting anything packed. So I’ll limit my gawking to one every few hours. The first I’m blogging about, “The Hitchhiker’s Field Manual” (1973), was pretty surprised the Deep South was not more hostile to freaks. 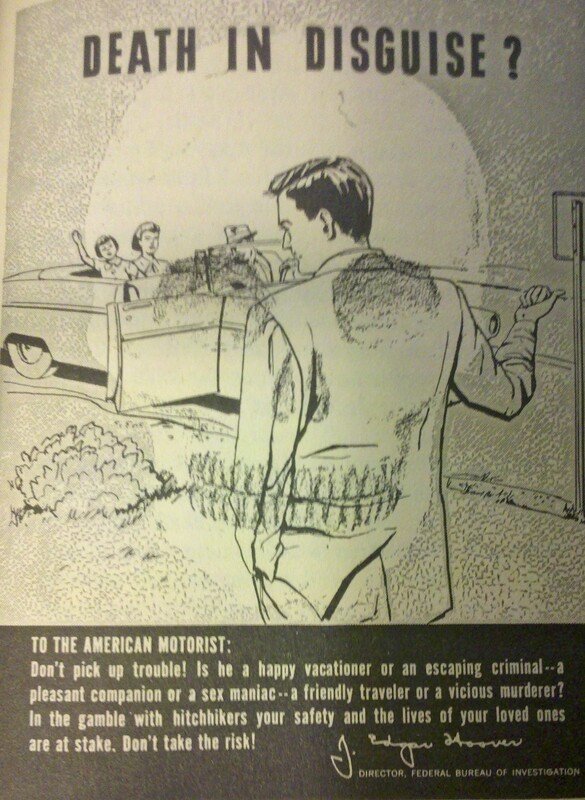 “Hitching in the deep South does present some real problems to the non-Southerner. … In many areas, particularly in parts of Alabama and Mississippi, there is still a great suspicion of and dislike for Northerners. Often this hostility can be broken down by genuine friendliness on your part. However it is true that Southern culture is more conservative and conventionally oriented., and that a freaky appearance will elicit more hostility than in other areas, although not that much more than in the Midwest. … Finally, Southerners tend to still take seriously ideas of good manners and respect for elders. Thus a great emphasis is placed on consensus and formality…. “Southerners are very often amicable and generous, and almost always courteous and civil. The pace of life is slow by Northern and West coast standards, and most people will either be cordial or mind their own business. And Southern freaks are mong the world’s nicest people. I have hitchhiked through the Deep South at least a couple of times. I met some very friendly people. It is a good place not to hitchhike in in the summer because of the heat and humidity. I have hitchhiked the United States for most of 17 years. I hear you about the heat and humidity! I haven’t hitched myself, but I have picked up and camped with hitch-hikers a couple of times during long-distance journeys. Alabama is like everyplace else in that mostly you find good souls and the few mean ones stick out because of how intensely unpleasant the experience with them was. Safe journey to you!